This is half on literature, half on religion; if you're here for the latter, stick around: I do get to it. I think that one of the mistakes that amateurs authors tend to make -- and I very much include myself here -- is to work too hard on world building. This is probably a particular occupational hazard for SF (broadly understood) writers, since of course (much but not all) SF takes place in worlds which are partially or fully imaginary; but I think it actually probably applies to all authors, even the most strictly of realist ones, who tend to do the equivalent in, for example, doing research to build (that is, in this context, accurately represent) the world they are writing in. What we should do, of course -- what the best writers do -- is simply work on the story, the text, and let the rest fall into place as it may. That this is a mistake can be seen first and most clearly in the fact that the best writers' work is filled with all sorts of contradictions, and few people seem to care. Shakespeare can include anachronisms, and have the age and timing of Hamlet be seriously difficult to unravel; and really it matters not a wit. One ready but (I think) clearly mistaken answer to this is to say, "Oh well Shakespeare was a genius, he can get away with this sort of thing, but others cannot." And it's mistaken because good authors at all levels do this. To take a very different example, Arthur Conan Doyle was notoriously careless in writing the Sherlock Holmes stories: was Watson's wound in his arm or leg? Who cares? It hasn't prevented Holmes from becoming probably the single most powerful iconic figure from popular literature in the last two centuries. And the entire spectrum from Shakespeare to Doyle to anyone you like -- high literary, the best of pure popular pulp, anything -- does the same. Read about books and you'll see comments about these little mistakes and errors -- errors that indicate that the world is somehow not fully imagined, not consistently created; and you'll see that they don't really matter. Even Homer nods. But if anything I am actually understating the case, I think. Because far from not mattering, often such inconsistencies become positive assets. Inconsistencies that originate in speed and carelessness -- or, more accurately, care being taken in matters other than world-building -- once recognized become sources of energy and complexity that drive a work to a higher level. Here the examples that occur to me are mostly from popular culture, although I feel fairly sure that any decent literary scholar (a category which does not include me) could come up with some high culture ones off the top of their head. Nevertheless, since I am simply trying to sketch a point here, I will use the popular culture examples. In fact, let me use one of the richest and best examples of recent popular culture there is: Buffy the Vampire Slayer. The point is that Buffy came with a lot of givens -- large parts of traditional vampire mythology that were simply adopted whole -- and that other parts were added fairly quickly in a show that looked like it might well not last longer than its initial half-length season. For example, the question of what a soul is and does in the Buffyverse is essentially unanswerable, largely because the writers clearly made it up as they went along. Angel is cursed with a soul, and therefore regrets his crimes -- but were they really his crimes if the soul was not there when they were committed? Normally the soul is taken to be the "he"; but Angel is a brooding regretful character so he regrets them anyway. How much free will is there without a soul? Various contradictory answers are given. Can a being without a soul love? It is said many times that they cannot; and it is just as clearly demonstrated that Spike does, genuinely, love Buffy, however much she (and he) might deny it. I'm not trying to rag on Buffy or its writers for this inconsistency here -- far from it: I think that this inconsistency is actually one of the show's strengths. A world of fairly simple bad-and-good sides is set up by the Vampire-Slayer mythology -- and then the complexities of character and storytelling lead them to make it complicated, complex, grey -- the end result being even more grey and complex than a show which started out to be grey and complex could be, because it is a moral complexity overlaid on a universe painted first in stark black-and-white terms. Giles's speech in "Lie To Me" about how the villains are easy to identify by their black hats is very different than it would be in (to take a very good show in a different mode) The Wire, because in the latter no one would ever suspect such a thing, it's silly -- but in Buffy many of the villains are easy to identify, by their crinkled brows and pointed teeth: which makes it all the more complex and interesting when, in the end, some aren't -- whether through evil humans, good vampires or (most of all) intermediate, undecidable cases. Spike is perhaps the most complex character in Buffy -- certainly the most morally complex character -- because he started out as a simple villain, and then was so compelling that the writers wanted to keep him around, so they made him progressively better, backslid for a story point here and there, had him go over the line, and then gave him a soul, describing the latter in terms that were clearly falsified by some of his earlier portrayals. In the hands of poor writers, the result might simply be an unbearable mish-mash: in the hands of writers of the Buffy caliber, it's extraordinary and complex fiction. This is just one example, but I think it could be endlessly multiplied. Tom Shippey, in The Road to Middle Earth, talks about how much of the power of Tolkien's work comes from the contradiction in the conception of the ring -- how it embodies two fundamentally contradictory ideas of what evil is -- the result of which is an end far richer than a more philosophically consistent view would be. Tolkien was a world-maker par excellence -- but his method of composition was not: he wrote the Hobbit without thinking through completely how it tied into his mythology, and then was left with contradictions that he had to think through; he launched into The Lord of the Rings without a clear sense of where he was going, which meant that contrary ideas were built in from the get-go. Quick contradictions lead to further stories, stories which try to deal with (thematic, philosophical, historical, factual) contradictions in the earlier ones -- and lead to a complex and rich fiction. Perhaps this is simply a common way by which fictional worlds (and in this I include the "worlds" that are meant to be ours) can portray the complexity of the real world: no fictional author can possibly design a world as complex as the real one, by more orders of magnitude than one can think; but inserting contradictions creates the appearance of complexity that leads to a variety of mimesis. The world is complex, not contradictory, but to any given viewpoint it looks contradictory, because we can't comprehend its complexity. This may not apply to all fiction, but it applies to a lot of it. And I think it applies to the greatest fiction of all time: religion. Religion gets its power from its early-adopted inconsistencies. A few very different ideas were merged, and the result is far richer than any single one of them could be alone. I'm brought around to this thought by a long and fascinating post by Sean Carroll at Cosmic Variance, which is, essentially, a review of Terry Eagleton's review of Richard Dawkins's recent book The God Delusion. (Link via Pharyngula.) After making an important distinction between three topics in Dawkins's book -- topics which Carroll correctly notes are confused by reviewers, thus allowing them to attack Dawkins's weaker points in the guise of attacking his stronger ones -- Carroll goes on to talk about the contradictions at the heart of (Jewish and Christian) monotheism -- contradictions which he says undermine the notion of God (and which P. Z. Myers, correctly in my view, says that theologians use to dodge awkward questions from different in audiences). All of this may be true, but as irritating as this intellectual slipperiness may be to atheists such as Dawkins, Carroll, Myers or myself, it is also the source of religion's strength -- and not just because it allows the avoidance of awkward questions. Carroll tells a story about the history of monotheism -- a story that accords with what I know, although I can't vouch for his details, and I also don't know how widely accepted this story is among those knowledgeable in the field -- in which one notion is shaped in such a way as to be contradictory, after which the resulting contradiction is itself melded with another contradictory idea -- leading to a truly rich and complex (as well as, well, contradictory) result. The beginning of the story (as Carroll tells it) is the evolution of the tribal god of the Jews -- imagined as simply our god, but not the only one -- eventually came to be conceived not simply as one of, or the most powerful of, many gods whose reality was recognized, but as the only real God, whereas the others were simply imaginary. This itself was a fruitful contradiction -- God was both the creator of and God for the whole world, and the special, personal God of the Jews. But then this "personal/tribal God of Biblical Judaism" was further merged with "the Unmoved Mover of ancient Greek philosophy." And the result is a Being which can be described in one breath as an ineffable essence which underlies the nature of existence and in another as a being with actual emotions like jealousy and love. Carroll (and Myers) point out that using part of this notion to weasel out of the silliness of other parts of it is, intellectually, unfair -- changing the terms in the middle of the debate, or depending on who the audience is: Bush can reassure many by claiming God speaks to him while theologians Clintonize about what the meaning of God "speaking" is. And they have a point. But it is also precisely this contradiction that gives religion -- which is, I agree, a fiction, although I agree with Carroll (and against Dawkins) that the question of whether it is a fiction which is, in sum, beneficial or detrimental to society is a very complex one* -- its enduring power. This is true in all sorts of ways. The richness of theology -- which, contrary to Dawkins's dismissal, is indeed a rich field of intellectual endeavor -- comes from its basic remit being the discussion of a fundamentally flatly contradictory notion. The rich Jewish literary tradition of Midrash -- which could be humorously but accurately described as fan-fiction based on the bible -- arises out of the need to explain contradictions in a supposedly divine and perfect text. The richness of Christian spirituality arises out of all sorts of contradictions -- that the trinity is nevertheless a unity, that Christ was both God and man, and so forth. Now, Dawkins would probably say that it is one thing to acknowledge the power of all this as a fiction -- which, to be clear, is all I am doing -- and quite another to assert it as metaphysical truth and guide one's life (to say nothing of others' lives) by it. And I quite agree, which is why in the Dawkins/Eagleton debate I am finally more sympathetic with Dawkins. Such is Dawkins’s unruffled scientific impartiality that in a book of almost four hundred pages, he can scarcely bring himself to concede that a single human benefit has flowed from religious faith, a view which is as a priori improbable as it is empirically false. I say "falsely" because Dawkins spends several pages discussing the literary importance of the Bible, and bemoaning the biblical illiteracy of contemporary culture. And Dawkins is right to do so: say what you will about the Bible, it is an amazing and (at least in parts) extraordinary work of literature that everyone should read. But what I think really is bothering Eagleton, although he doesn't say so and (I am guessing) isn't aware that this is what is really getting his goat, is that Dawkins doesn't give this credit to any religious movements or texts that occur after the bible. (Or if he does, it is in passing and very much against the overall spirit of his book.) Eagleton would want to say that, at the very least, theology and religious writing has the same sort of literary value that the Bible does -- maybe not as much and maybe not as consistently, but it still has it and is important for that reason. And on this account I agree with Eagleton. And here's the point I am making. The very inconsistencies in the notion of God that make Dawkins dismiss it -- the very inconsistencies that give Eagleton the room to try and weasel out of the metaphysical points that Dawkins effectively drives home -- are precisely what gives religion, in the Bible and later, its genuine power. It is, I think, no more than a fiction (and I think that this is actually fairly clear): but it is a rich and powerful fiction, one that has sustained many in distress and moved many to acts of selflessness and heroism that they would not otherwise have done. Dawkins (and others such as P. Z. Myers and Sam Harris) wants us to be able to say, clearly, that the metaphysics is clearly bunk -- and I agree and would like more people to say so as well. But I think (in contrast to Dawkins and Harris) that, if religion is a fiction, it is an astonishing fiction, and one that can't be dismissed on the grounds that there weren't clocks in Julius Caesar's day and that we don't even know which limb Watson was wounded in. And I think that those of us who hold Dawkins-like positions on the metaphysics -- and who worry greatly about the political extensions of religion in the world, and find in them the most powerful single source of evil today, whether we are talking Islamists, Christian fundamentalists, or others -- would be more persuasive if we were to acknowledge that beauty that others see in religion, and, rather than insist that it is in fact ugly, simply insist that, beautiful as it may be, it is no more real than Frodo's inspiring, heroic, utterly imaginary journey up Mount Doom. Postscript to the footnote: And, picking up from the end of the essay above, I think that Dennett goes further than Dawkins in recognizing the beauty of religious fictions. Dawkins might reply, fairly, that Dennett has been no more persuasive than he, thereby giving a counter-example to my argument that a Dennettian approach will be more readily accepted; and I cede the point. But either way this will be a long argument; and while so far results from any approach have been few, I claim that Dennett's position will in the end be more effective than Dawkins's -- and that it also has the additional advantage (to use the Kissingerism) of being true. It's a marvelous recording, at least to my ears. Welles, of course, was a famous radio producer and actor before he turned filmmaker, and so his voice and aural presence is astonishing. He really puts a lot of life into the poems. Needless to say, it's just one interpretation -- not always how I hear it my head, and I'm sure not how you hear it in yours -- but it's a wonderful one. His selection is about 50 minutes long; I highly recommend listening to it. The recording can be found here (link via); this is a direct link to the real audio file. The numbers from "Song of Myself" that Welles performs are: 1, 2, 3, 6, 7, 10, 14, 15, 21, 24, 26, 27, 28, 31, 33/46*, 48, 51, 52. I put an asterisk next to 33/46 to signify that, in that instance, Welles (for some reason) attaches the first four lines of 33 to 46 (which is complete). Apart from that oddity, there are two lines which are skipped on the recording -- I think it's taken off a record. One is the sixth-to-last line of 14, which should read "I can eat and sleep with them week in and week out," but which skips and so sounds just like "week in". 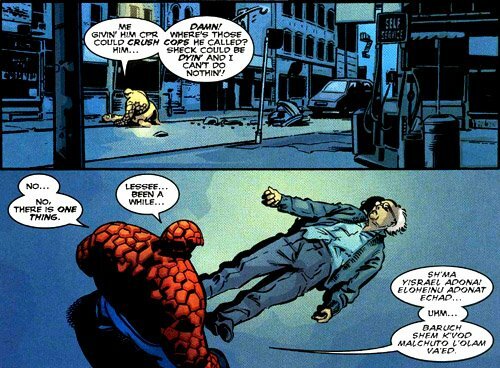 The other is, damn it, the very last line of 52 -- the end of the cycle ("I stop somewhere waiting for you.") -- which seems to have been cut off in the process of putting it online. Apart from that, the above-listed numbers are complete. I don't know anything about the site that the recording is hosted on, but it looks like they have a bunch of other stuff. They have a brief 1890 recording of Whitman reading one of his own poems, "America" -- but one that is so scratchy as to be all-but inaudible. And, on a different page, along with some speeches by Malcolm X and Martin Luther King, they have what purports to be Orson Welles's famous radio version of The War of the Worlds; but I haven't listened to that one to check. One great American artist performs another. Check it out. One of the wonderful things about Teresa & Patrick Nielsen Hayden's blog Making Light (which I recently mentioned in another context) are the little links they have in the upper left-hand corner. Called "Particles" and "Sidelights", they are links selected respectively by Teresa & Patrick, and linked to with a single line. Often funny, sometimes moving or important or bizarre, they're one of the touches that turns Making Light from one among many good blogs to a must-visit site. 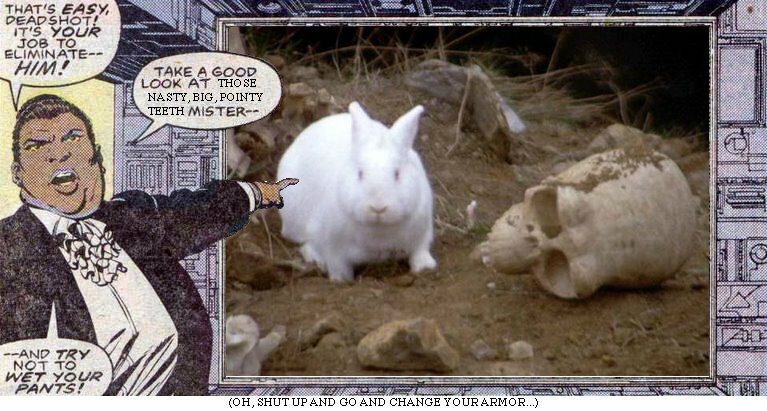 Well, a bit less than two weeks ago Teresa linked to a site with the cryptic but unquestionably intriguing words "All We Want to Do Is Eat Your Brains." Naturally I had to click through. You're back? Funny, wasn't it? What, you just read the lyrics? No, you have to actually click the button and listen to the song. Right, that one; the one that says "play song". Okay, go try again. Ah, now you get it, right? Well, if the answer is no you might never do so. But I bet for a lot of you it'll be yes. Which is, as previously mentioned, the point of this post: to try and introduce a few of you into the wacky and wonderful world of the music of Jonathan Coulton. I must admit I probably heard "Re: Your Brains" (the official title of the song whose chorus is "All We Want to Do is Eat Your Brains") at least a dozen times before it occurred to me that if I liked it so much I might like some of his other songs as well. Partly it's just that, in these internet days, I'm more used to finding one good song and just iPoding it, rather than using one song as a start to digging around a whole new artist's work. And partly it was simply that I was enjoying that song so much (in the slightly obsessive-compulsive way I have whenever I find a great new song, namely over and over) that I didn't get around to it. But finally I clicked through to Jonathan Coulton's song page. Man, but that guy is great. I'm still getting into his music -- I've heard a couple of dozen songs, but have only listened to a dozen or so often enough that I feel that I really know them (I tend to like to hear a song a lot before I really feel like I fully know it) -- but here are some notes based on what I've heard thus far. He's very much a humorous musician. I haven't heard one song yet that isn't deliberately comic or, at the very least, distinctly quirky. But I think that if he was merely funny I would have just laughed and kept going. He's also a very appealing songwriter; his songs are catchy and fun and just plain good to listen to, in addition to being funny. Which also means that, while I'm going to be quoting his lyrics here, you should really click through and go hear his songs. (While he asks you to pay $1 for most -- although not all (some are free) -- of his songs if you actually download them, you can actually listen to them all for free on line.) So listen: they sound better than they read (and I think they actually often read well), and you might well go on listening to them just for their quality as songs, beyond the point where they are (as it were) active jokes for you. Jonathan Coulton's sense of humor is very much in the wacky style -- a delighted celebration of absurdity, sometimes absurdity borrowed from areas such as SF, such as in the Zombies song (yeah, in case you didn't go listen to it, the "Re Your Brains" song is about a bunch of zombies). Another type of absurdity he likes is the bizarre juxtaposition -- to again stick with "Re: Your Brains", it's talking about Zombies in business (or office) jargon. As part of the latter, his songs vary a lot in style -- some are folksy, some are rock, some are Christmas carols, etc; often the absurd juxtaposition is between the lyrics and the song's genre. Again: either this is your sense of humor or it's not. It's definitely mine -- and if it's yours, then go and listen, because the tune is also incredibly catchy, and he has follow-up jokes in the latter verses: it's not one of those cases where after one joke the person writes the song and then has nothing else to offer. Another thing he clearly likes to do is formal experimentation. It was through one of those, in fact, that I realized that I had in fact heard one of his songs before: one of his songs -- or, rather, the video version of it, because (as he says on its page) this is really a song which needs to be seen as a video rather than simply listened to -- had made the email or blog rounds at some point and I'd watched it, liked it but (unlike in the case of "Re Your Brains") hadn't pressed the matter. The song I'm referring to here is "Flickr", where Coulton writes a set of lyrics describing various photos he found on Flickr. The sound is sweet and nostalgic, as if he were describing a photo album -- but he very much isn't, hence the humor. I can't help but wonder what Mandelbrot thought of those lines when he heard them (or would think if he did, although I presume that he did at some point). (Coulton himself went to Yale, incidentally.) "Mandelbrot Set" is one of about half a dozen of his songs (along with "Re Your Brains", "The Presidents", "Code Monkey" and "Chiron Beta Prime"... maybe one or two others, maybe not) which has, at some point in the past two weeks, been my absolute favorite Coulton song, as opposed to the others here, which have only been among my favorites. • "The Presidents" -- one line per president, rather randomly selected although mostly accurate facts (although there's one historical mistake (about Garfield), as Coulton notes on his lyrics page). For some reason LBJ's line always makes me feel sorry for him, although of course it really should make me feel sorry for its other subjects. It's just that he wasn't that much worse compared to other presidents -- and was very good on (some) other issues. Great song. • "Code Monkey" -- this was, I believe, Coulton's first big "hit", a song which was slashdotted at some point -- not surprisingly, given that 'Code Monkey' is slang for a computer programmer doing dull work. This one I heard a few times before I really listened to the lyrics... which, let me just say, you should not do for the first time behind the wheel of a moving car. • "Ikea" -- yeah, about the store. Incredibly catchy. Bonus points for referencing Thor. Unlike the others, this one took a few hearings to grow on me. But it's really great. • "Kenesaw Mountain Landis" -- This is a really weird one, a sort of tall tale about Shoeless Joe Jackson that has only a tenuous connection to the historical facts, and includes as well the (wholly fictional, I believe historically real (if rather different than Coulton's version)) eponymous character. • "First of May", which is a "Poisoning Pigeons in the Park" for the 21st century (and whose lyrics are NSFW, by the way). Those are the dozen or so that I've gotten most into so far -- as you'll note if you click through, I've heavily favored the free ones for the obvious reason. But Coulton's song page has more than fifty songs on it, and I expect I'll be finding new favorites for a while now. But one new favorite -- Jonathan Coulton -- is clearly here to stay for me. I hope you'll give him a try. And watch out for Zombies. Reasonable as they may be. The U.S. is now a model for other countries... who want to torture their citizens too, just like we do. Of course, even if the Democrats win both houses on November 7, some idiots are saying they should make nice with the pro-torture, anti-habeas corpus, pro-war crimes, incompetant-to-tie-their-own-shoes-let-alone-govern-a-country-or-win-a-war party. But good lord, it would be something. Did I mention global warming? Too little; maybe too late. But if we can win, it'll be something. Two more weeks. Do what you can. We need this one, folks. Update: Publius is more elegant than I on a similar point, with an added good point about what a defeat might actually mean if (Heaven forefend) it might mean. Check out his post. Skip on down to the next post if you don't want to be spoiled. Battlestar Galactica is not, to my mind, quite as good as Veronica Mars or The Wire (the latter of which I see only on DVD, so only through Season Three at this point) -- which are far and away my favorite still-ongoing shows at the moment. But BSG is a very good show, which I am quite glad to be watching and wouldn't want to miss. As I just caught up on the most recent (i.e. as of last Friday) episode of BSG. Herewith a few random thoughts. * I was sort of surprised that they didn't milk the occupation situation for longer. I had thought that, after going to all the trouble of setting the new status quo up, they would actually run with it for, oh, half a season or so -- really tell some individual, free-standing stories set on occupied Caprica, and use that to reboot the show a bit. They're not back to precisely the pre-settlement status quo -- they lost the Pegasus, of course, and a lot of individual characters are in rather different situations -- but it's fairly close. Given that BSG was definitely drifting in the latter half of its second season, I'm surprised they didn't use the change of pace -- which I, like almost everyone else, found to be a reinvigoration of the show -- to more effect. I'm only slightly worried about the upcoming episodes -- they've clearly got a pretty good grasp on what works and what doesn't -- but I was surprised. * Anyway, the title for the next episode (don't click unless you're willing to have the title, at least, spoiled) is very promising. So is the fact that Jane Espenson is writing an upcoming episode. * Baltar's claim that if he didn't stop the nuke from going off no one would get off made no sense at all, given that people had already left. I was rather confused on this point. I think the analysis of the BSG Wiki -- that Baltar simply didn't know the situation (and presumably Gaeta didn't either, since he seemed to buy Baltar's claim (unless he was simply willing to fall for any excuse not to have to kill him)) -- seems like the most straightforward explanation. But it was a bit untidy. * The best story developments they got out of the four-and-a-bit episode stay on New Caprica, of course, are the character changes -- most of the major characters are in very different places than they were. I wonder to what degree this was done deliberately -- i.e. they set up the occupation so as to set up arcs they wanted to do, but couldn't get to in the earlier compressed-timeframe that held up through the end of season two -- and to what degree they simply thought the occupation would be a good story, and then used it to spin the various characters off in different directions. Overall, a good start to the third season -- a distinct return to the strength of the first season and a half (counting the miniseries as part of season one) after the comparative unevenness of the season 2.5. Let's hope they know what they're doing and can keep it up. If this doesn't make you laugh early on, just bail. Because either you'll get why this is the greatest thing ever, or you won't. If not, stop as soon as you figure that out. It won't get any better for you. The rest of you will love it. Actually, I have two rather more serious posts a bit down-blog, which I was fairly tempted to deliberately leave at the top, since I think they're closer to the spirit of what I hope to do here than, well, this. So if this doesn't make you laugh, read this and this, and you can weep for our country instead. I don't often post multiple times in a day, and the others are better pieces of writing -- I sort of hate to see them get buried beneath this frivolity. 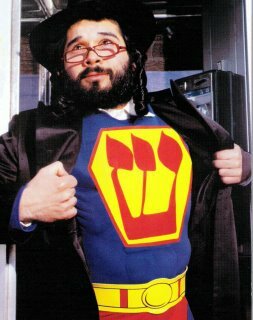 Let me say that one more time, just so we're all clear: Superman went to a Shabbos dinner. And not just in a brief panel. No, he eats there over the course of, like, three pages (reportedly -- I haven't read it, although obviously I have to go get a copy immediately). This was in Action Comics #835, written by Gail Simone and drawn by John Byrne. 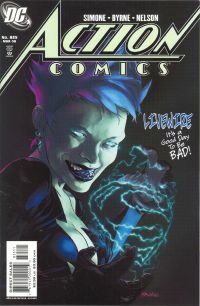 Most of this issue is apparently devoted to other matters, a fight against someone named Livewire, but at the end of the comic he goes to Shabbos Dinner with some couple. Also, if those are rolls to Superman’s left? They should be covered. During Kiddush and until the blessing on the bread is made, any bread products on the table are covered. 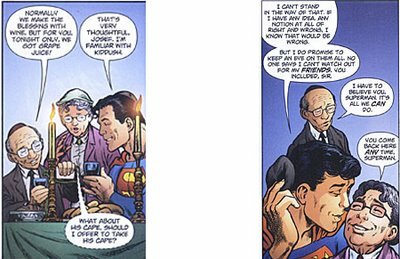 Superman, you mean to tell me you’re "familiar with Kiddush" but you don’t know rule one of Orthodox male/female interactions? That’d be look, don’t touch. You don’t kiss a Jewish woman on the cheek. Ever. Unless you’re family. This is a major error here. But stick around (if you've come this far), 'cause we're just getting going. Superman is NOT A HUMAN. I am not a Talmudic Scholar, but wouldn't his behavior be covered under the rules for animals rather than persons? it is well established that nonhumans are NOT responsbile for obeying Jewish law. He can even kiss Orthodox women- he cannot break ritual purity any more than a dog, cat, or helper monkey can. I'm not sure that Superman is actually kissing Esther in that panel, he may just be doing the California air-kiss thing, which would be fine. Although given the errors he made with the flowers and the doorbell I wouldn't expect Esther to trust him not to get it wrong. Could it be that the couple Superman is visiting simply isn't as observant as everyone is assuming? And why blame Superman for making mistakes? Why should he know better? 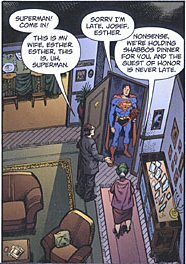 Now, regarding the debate about Superman's (and other heroes) human status, would Josef and his wife know that he's alien? I'm not up on whether Superman's origin is common knowledge in the modern DCU. The problem is how do you define “humanity”? I myself would not make the attempt. Superman and J’onn seem to act as though they have souls though. Among most of my orthodox older relatives the women certainly touch men - it seems that the younger generation is more stringent. So it would not surprise me at all for a woman of Mrs. Josef's age to allow heself to be kissed on the cheek. This all leads into lots of other discussion, including a lengthy consideration of the whether the fact that Wonder Woman was sculpted in clay by the Greek Gods makes her an idol, or is she just more like a golem? The writer of the issue herself shows up in the comment thread to mention that she loves the thread, that she did do a lot of research, that not everyone is strict about the things the writer is mentioning (true), but also to defend the right of readers' criticism. Being Jewish sure looks complicated. Many versions of Superman keep the Kent clothes hidden in a pouch inside the cape. While flying on Shabbat, this is no problem - the air is a makom ptur. But once grounded, he'd better be in an eruv or he's got problems. And yes, the section on brit milah contains the obligatory Larry Niven reference. ...And that, alas, is the end. 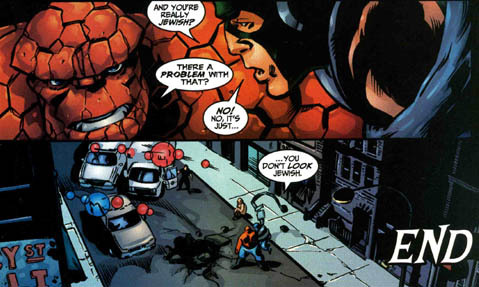 There are lots of other Jewish superheroes, too. But never fear! There are lots of superheroes of every religion, including Jewish Catholics, Mormons, Buddhists, Objectivists, Wiccans, followers of traditional Greek and Roman Gods and even (horrors!) some atheists. Don't miss the pictures of superheroes grouped into teams by religion -- if you've made it this far, you'll love it. It's not so much that ChurchReport.com has labeled David Kuo -- Christian, conservative, former member of the Bush Administration (as second in command of the faith-based initiative) David Kuo -- a member of the Axis of Evil for daring to publish a book critical of Bush, putting him in the same league as North Korea, as Adele M. Stan notes (to whom also a hat tip for the link). That's just par for the course for the "Bush is Jesus" Christians that we have around these days. David Kuo forgot one important lesson: Judge not lest ye be judged. To make it clear, there should be no office of faith-based initiatives. The very idea is digustingly offensive. To say so does not make me a "secularist" as many of the devout understand how important such a wall is to their faith. I am merely being an American. A wall of separation between church and state was clearly established by the Founders and over the years, that wall has been determined, quite rightly, to mean that no religion can be privileged by the US government. And that means giving 'em money or other special breaks. Kuo's basic point appears to be that faith-based initiatives would be great, provided he was in control of it, or some other incorruptible evangelical. No, it wouldn't. It is simply un-American, a direct violation of the Constitution and American traditions. Only shrillness can save America. That fact has allowed them to tell a deeper, a bigger, a more important truth that has eluded those who speak truth in the dry tones of "factual" reporting: the truth about the genuine nature of this administration, and the harms it has done, is doing and, unless we manage to stop it, will do to our country. They can do it because comedy has always allowed jesters to speak truths to kings. Because people will listen to a joke who would not listen to an anguished cry. Because today, it is not facts we are lacking. The facts are all there: the lies, the crimes, the attacks on everything that is good and decent and free about his, our once-noble country. Bush and his henchmen's true uniqueness is not what they have done, but the brazenness with which they have done it. Bush breaks the law and boasts; he guts our freedoms and smiles. So what to do, when truth is easily found, but is drowned out -- by lies, by gossip, by boredom? 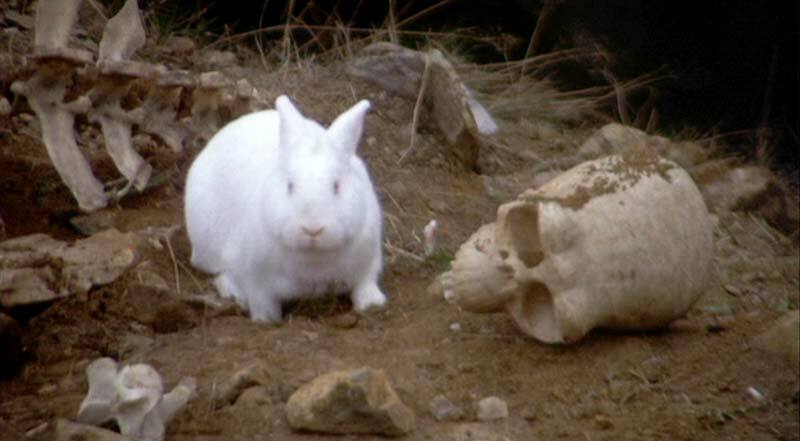 What to do, when putting facts down in plain order kills them, and allows us the understanding of dissection but not of a living ecological study? What to do when plain reporting itself becomes a lie, when the only way to tell the truth is to scream it, for anything less is a lie, not in fact, but in tone? All we can do, then, is scream. And hope we are not drowned out by the wind. And honor those who scream louder than we can. How few actual journalists have spoken, not simply words, but in a tone that truthfully conveys the state of our nation? Paul Krugman, of course, has done so for years; but this is the age of digital media, not of dead-tree print; and who listens to Krugman? Well, Keith Olbermann is speaking truth: truth in his words, truth in his tone. In recent weeks, he has being doing so again and again and again and again and again and again and again. And he's been doing it on television. Oh, I wish he would speak more about, say, Iraq; but then, there are so many issues to be shrill about these days. And the full-scale attacks on our civil liberties, and on truth, by this administration is as worthy as any. And Olbermann is telling the truth about them, to his eternal honor and credit. We should - we must -- honor him for it. While there's still time. Before someone decides that he is an enemy combatant and we no longer can. And if you think that that last sentence is too shrill go read -- or, better yet, watch and listen to (because it is not so much the words as the voice that is so special) -- all of those links above. And remember that, if you think that Olbermann's safe, it is no longer because there is a law protecting him. It is simply because you -- yes, you -- are trusting George Bush's honor and honesty and respect for the truth. And then honor Olbermann's words. While we can. While he is still here. While what is left of our country is. Not every crime is done out of evil motives. Some people would go so far as to say that nothing, really, is done out of evil motives: that people always act out of an idea of the good, and sometimes they're simply wrong about what that entails. I myself wouldn't go so far as to say this, but it was a view held by, among many others, Plato, so if you think this you're in good company. Nevertheless, I do think it's pretty indisputable that not every crime is done out of malevolence. Indeed, some crimes are pretty straightforwardly benevolent in motive; far more are of mixed motive, and/or a case in which the criminal is fooling themself as to the likely effects of their actions. I think it's quite possible, for example, that the police officers who shot Amadou Diallo didn't have any particular malevolent intent: that, in fact, they sincerely believed that they were under attack, that they thought they saw a gun, and that they fired -- yes, even 41 times -- under a genuine fear for their safety. But the point is that a genuine fear is not necessarily a legitimate fear. Theirs was a fear that was, presumably, born out of racist beliefs -- again, possibly not explicitly racist beliefs: they did not set out to lynch someone -- but the sort of beliefs that can color ones perceptions and make one see a gun where there is only a wallet. Beliefs per se are not criminal of course: but when acted upon, they can become so. Some fears are illegitimate. And even apart from the fear's source, while fear for one's safety is a legitimate motive for action, it's not a legitimate motive for any possible action. Act upon genuine fear wrongly, and you've committed a crime. And the same goes for a desire to improve the world. The person who decides to kill a mafia don may have completely laudable motives: the don is running a criminal enterprise, and has certainly murdered people in the past; the neighborhood will be much better out from under their spell. But to shoot the don in the back is still murder. Perhaps, in some circumstances, it's justifiable homicide: but those circumstances are exceptional, not normal. And if one misses the don, and hits the don's child -- or if one hits them both -- then one has murdered a child: and no amount of I-went-in-this-with-the-best-of-intentions talk will alter that one iota, because one oughtn't to have been shooting in the first place. Well meaning or not, it was not a legitimate act. The point of all this is that these are not simply mistakes. It's not enough to say that you meant well, that you had good intentions, that it seemed like the right thing to do at the time, that it really looked liked a gun not a wallet, that you really thought that the Don was alone and that he was unquestionably a wicked man, that you just had a lot of beer it's not like you aimed a riffle for chrissakes. It won't do because these weren't mistakes, or weren't just mistakes: these are crimes. People are dead. And we are responsible. I bring this up, of course, because people are dead -- approximately 655,000 people, although it is one small part of the circumstances of our crimes that we will never know precisely how many -- indeed, our knowledge is so poor that even the best available studies have an error range of hundreds of thousands of people. But it doesn't matter. Because people are dead. And we are responsible. And it was a crime. Not a mistake; not a poor policy decision; not a bad idea in retrospect but how could we have known really. A crime. To reverse the famous saying of Talleyrand: it was worse than a blunder; it was a crime. Because we didn't have to do it. We were not under attack, or under any imminent threat -- and if not all of us knew it, than all of us should have known it: our perceptions were distorted by anger and fear and misplaced trust and all sorts of things that, while not crimes in and of themselves, become crimes when you act on them in a certain way. If we had been attacked, really attacked by the Iraqis, it would be different. (Which is why Afghanistan, however smegged-up things are becoming there too, is different.) But we weren't. Nor were armies looming on our boarders, shouting that they would throw us into the sea, as in Israel in 1967. What we had were grainy photos of trailers and lies about Africa. So it was a crime. A crime, because it doesn't matter that we, or some of us, thought that we would make the world a better place, thought that the person we were after was a horrid criminal who had killed many people in the past (and Saddam unquestionably was that), thought that it would spread democracy like a rosy-fingered dawn: it doesn't matter. Because we attacked someone without being attacked, and so can't make the excuse that our aim was poor. If a massacre or genocide had been ongoing, it would have been different. Intervention in a specific, ongoing massacre may be justified -- and may simply turn out to have been a blunder if it goes badly, because we would have been acting in a legitimate, moral way. But that wasn't the case here. Saddam had killed many people; Saddam was a vicious tyrant; but there was not ongoing killings we intervening to stop. We were simply out to make the world a better place (or some people thought so, and others have adopted this as the ex post facto justification). And we missed, and we hit 655,000 other people. For which there are no excuses. And all of this is apart from any of the less laudable motives that may have been involved -- as some surely were, since there were many players and many actors and many calculations and many motives, and if one person's motives are so often impure, how impure will the motives of an entire government -- an entire ruling class -- an entire country -- be? We may not know all those motives until after the archives are opened, the documents examined and the causation carefully charted out; even then it is sure to be a horribly complex story; but in many ways it doesn't matter. The car has crashed; the people are dead; what drove us to drink is neither here nor there. That we blundered in what we did is all the worse, since it made it worse; but it was not simply a blunder. It was not simply a mistake. It was not that we all thought so and who could have known. It was our crime. All of us. As Billmon so eloquently wrote yesterday (in response to Riverbend's anguished re-entry into blogging), none of us -- even those who opposed the war -- did enough. Because it happened. And people are dead. Responsibility is not a zero-sum game; it is our country that has done this deed. So we are guilty. All of us. But -- as much as it may depart from Billmon's wisdom* -- I can't help but say that we are not all equally guilty. Those who supported the war are more guilty than those who opposed it. Those who wrote or marched to support the war are more guilty than those who supported it silently. Those who created a climate of opinion where this scheme took hold are more guilty than those who spoke in its favor. Those who abetted the action, by voting for war resolutions or attacking those who did not, are more guilty than those who simply made the idea seem good. And those who decided on the war are the guiltiest of all. This should not make us feel better. The blood of hundreds of thousands of dead will stain enough hands that none of us can feel entirely clean. But it should make each of us feel worse, according to the measure that they supported, or failed to hinder, this crime. And perhaps -- maybe, maybe, maybe, maybe, maybe -- we can learn from our mistakes. I don't really think so: this after all was precisely the war that we should have avoided by learning from the mistakes from Vietnam, the previous crime. Of course there are differences: this is not a game, where we will see precisely the same patterns again. But it should have been clear enough. To many of us, it was clear enough. But we didn't stop it. Maybe we couldn't have. I don't know. All I know is that, whether we could or not, we needed to. Because people are dead. And we are responsible. * (Peripheral) Update: As long as I'm linking to Billmon's piece, I should link to this very interesting reply by Amanda Marcotte which I just came across. I regard it as an impious and detestable maxim that in matters of government the majority of a people has the right to do everything, and nevertheless I place the origin of all powers in the will of the majority. Am I in contradiction with myself? There is one law which has been made, or at least adopted, not by the majority of this or that people, but by the majority of all men. That law is justice. Justice therefore forms the boundary to each people's right. A nation is like a jury entrusted to represent universal society and to apply the justice which is its law. Should the jury representing society have greater power than that very society whose laws it applies? Consequently, when I refuse to obey an unjust law, I by no means deny the majority's right to give orders; I only appeal from the sovereignty of the people to the sovereignty of the human race. Je regarde comme impie et détestable cette maxime, qu'en matière de gouvernement la majorité d'un peuple a le droit de tout faire, et pourtant je place dans les volontés de la majorité l'origine de tous les pouvoirs. Suis-je en contradiction avec moi-même ? Une nation est comme un jury chargé de représenter la société universelle et d'appliquer la justice qui est sa loi. Le jury, qui représente la société, doit-il avoir plus de puissance que la société elle-même dont il applique les lois ? Quand donc je refuse d'obéir à une loi injuste, je ne dénie point à la majorité le droit de commander; j'en appelle seulement de la souveraineté du peuple à la souveraineté du genre humain. Not kidding. It's part of a G--gle B-mb. (Not sure if we're supposed to avoid using the actual words or what...). I am also back-dating it so that it appears below a bunch of actual, y'know, entries, but still appears on the main page. (I'll keep it there until the election, then let it slip off.) I know my blog gets no hits but, hey, what's the harm, right? If you're curious what this is about, go here (via). Otherwise, skip down to the next entry. Click on the picture for a larger version. For the original, the challenge, and the other entries, go here. Source of second image here. Teresa Nielsen Hayden is an SF editor at Tor Books and (along with her husband, Patrick Nielsen Hayden, likewise an SF editor at Tor) blogs at Making Light. As I've noted before, one of the central criteria for inclusion in this series is being worthy of rereading. And one sign of that is when you're digging through their archives, finding that no damnit they don't have subject archives what about Google Yes! Google comes through and then rereading the post -- particularly if you're doing all of this years afterwards. It was when I was doing that for the second or third time for this particular post that it occurred to me that, yes, it really deserved an entry in this series. So I hereby present the seventh official Attempts Best of the Blogosphere™ award to Teresa Nielsen Hayden's brief, powerful blog post "Things I Believe". It is an Easter post, a declaration of a unique, intelligent and deeply moral faith. I myself do not share Teresa's beliefs: she is a Christian; I am an atheist (with a Jewish cultural identification). But I found her declaration extremely moving. Unless you have an extreme, visceral negative reaction to any Credo of any sort, I suspect you will as well. For that matter, she includes some entries that even a die-hard atheistic naturalist can agree with, such as "I believe it’s a sin to throw out awkward data" -- as long as one allows for an interpretation of "sin" which fits it within an atheistic, naturalistic framework (as I do, and as I suspect Teresa would understand as well). I believe that if God is as advertised, God’s ways and means and purposes cannot always be comprehensible to us. I believe in the God of the Burgess Shale*, Who not only made creation stranger than we know, but stranger than we could ever imagine. I believe it’s a sin to throw out awkward data. I believe that the God who made (among other things) light, and space, and number, and time, and the spiral curve of Fibonacci numbers, must be acknowledged to understand more than I do about why there’s pain in the world. I believe God put that itchy spot on our backs, just exactly where we can’t reach it, to encourage us be to nice to each other. I believe God doesn’t play mean practical jokes on His children; for instance, the ones He makes gay. It's a wonderful credo, and if more Christians believed it, rather than the Jesus-is-all-about-giving-money-to-the-rich-hating-gays-and-starting-wars version that seems current in today's America, the world would be a far better place. Teresa Nielsen Hayden is actually the first author of any of the posts in this award series that I've met. She (and Patrick) are regular attendees at Readercon, my favorite SF convention, and I have spoken to her once or twice -- nothing serious or notable, really, but enough to know that she is as gracious and intelligent in person as she is online. She also is good an panels, but that's a whole 'nother topic. Teresa regularly says that one of the best things about Making Light are her readers, and that if you miss the comments you're missing half the fun. I think this is quite true, although in all honesty the comments on this particular post don't show the fact off as well as many other posts -- they're heavy in the "that was beautiful, thank you" vein, complementing Teresa's post in the praise rather than complete sense of the word. Some people, however, add their own beliefs to Teresa's -- in something like the way that (later) people would add their own entries to John Scalzi's post "Being Poor", featured earlier in this series. So do take a look at the comments if you feel inclined. But either way, do make sure to read Teresa's post. I am far from convinced that faith in general is a good thing; but the faith she displays there is not only powerful and moving, but clearly a force for good. It is a Credo worth reading, and worth rereading, whether or not you subscribe to it. Would that it was more widely shared: that more of today's believers held a faith so imbued with wisdom, with charity and with love. For I believe that such wisdom and charity and love are the greatest part of any life of good will, whether or not that life is a life of faith. I believe such a faith as this, truly lived, could help to save us all. A new study has estimated that 655,000 more people have died since the U.S. invasion of Iraq than would have died had things continued as they were. Think about that number. 655,000. That's an unimaginable number of human lives. Of which 30% are estimated to have been directly killed by U.S. and allied forces. And again: that's not 655,000 people killed, but 655,00 more people killed than would have otherwise been. Here is David Brown's article for the Washington Post -- bizarrely buried on page A12 rather than blazoned on A1. The previous study done by many of the same researchers came under a lot of criticism -- largely unfair criticism. So in preparation for the inevitable wave of attacks on this new study, let me recommend the various Crooked Timber posts on the previous study's methodology and critics: first post, second post. As Kevin Drum says, not only is it the case that "their [earlier] methodology turned out to be sound and the objections mostly didn't hold water," but "the figures from their new study buttress the previous one, and also match up with other data, which suggests their methodology is on target." One frequent critique of the earlier study was based on the confidence interval which was wide -- although, as the second of the two Crooked Timber posts notes, people tended to emphasize only the lower side of the figure: "If your critique of an estimate is that the range is too wide... it is dishonest to title your essay “100,000 dead – or 8,000?” when all you actually have arguments to support is “100,000 dead – or 8,000 – or 194,000?”" Even if this distortion is repeated, however, it will be little help to apologists this time around, since (via Juan Cole), the lower end of the confidence interval is 420,000 -- still an utterly horrific figure. And, of course, it is equally likely that the upper end is correct, and as many as 790,000 are on our consciences. Although, of course, the 655,000 figure is the most likely. This is a staggering, horrifying figure which can't be wished away. We need to deal with what we are responsible for. Although how can a nation begin to atone for something like this? • Glenn Greenwald has commentary here. • Digby puts this figure in context. • Matt Yglesias comments (briefly) here. • Sam Rosenfeld notes how the two Crooked Timber posts kept him from drinking the apologists' kool-aid. • Shakespeare's Sister comments here, and also notes Bush's (groundless) dismissal of the study here. • Via Crooked Timber (natch), the actual report is here (pdf file). • John Cole has the Top 10 GOP Excuses about the report; earlier post on the same blog here. • At the TNR blog, Bradford Plumford and (more briefly) Elspeth Reeve comment. • DJW of Lawyers, Guns and Money tackles some of the apologists here and here. • Majikthise weighs in with a lengthy post. I'll add more links as I see them. Update: Links added. I'm busy today, and don't have time to surf around much, but I thought I'd see more discussion than I have. Save for a few people who simply linked to/quoted from news about the survey, the above is all I've seen. Probably I just don't have time to look properly, but I can't help but wonder if we're just all inured to the horror by now. Or are other horrors simply too consuming? Anyway, if anyone else has any links I've missed (and I'm sure there's lots), please leave them in comments. Further Update(s): More links added. Final Updates: I'm going to stop collecting links, because this way madness lies. But as a final few pointers, here's Majikthise's second post on the topic (first is linked above); and two posts from Crooked Timber (new ones, on the latest study, not the ones I linked above): first, second. Okay. That's it. -- Finito. -- Really. -- Stop snickering, it's not polite.